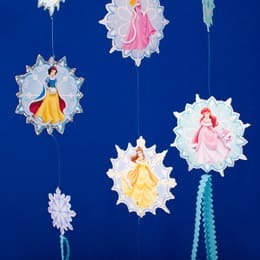 Forget fancy chandeliers -- this mobile features the Disney Princesses and will make a fine addition to your castle. Print the snowflakes on regular paper or cardstock and cut them out. Print more pages if you want more snowflakes or a longer mobile. Fold a page of snowflakes in half along the gray line so the design is on the outside. Open the page and spread wrinkle-free glue on the back of the page, covering the area where the snowflakes show through the paper. Fold the page again and press to smooth. Allow the page to dry, then cut out the snowflakes. Repeat this step with all printed pages. Once all the snowflakes are cut out, you may choose to decorate them with glitter. When the glue has dried, punch holes in the top and bottom of each snowflake. Attach the snowflakes together using small cut lengths of string or fishing line, about 8 inches long each (you should have extra to tie the ends to the snowflakes). Repeat this step until all the snowflakes are attached. Tie a longer piece of string or fishing line to the top snowflake and use it to hang your mobile.